Welcome back, Ran-dum the Demonspawn Chaos Knight. We return to the dungeon this time, and fight a stone giant (essentially upgraded hill giants, can surprise you with their damage.) It's a pretty even fight, but we prevail in fine form. 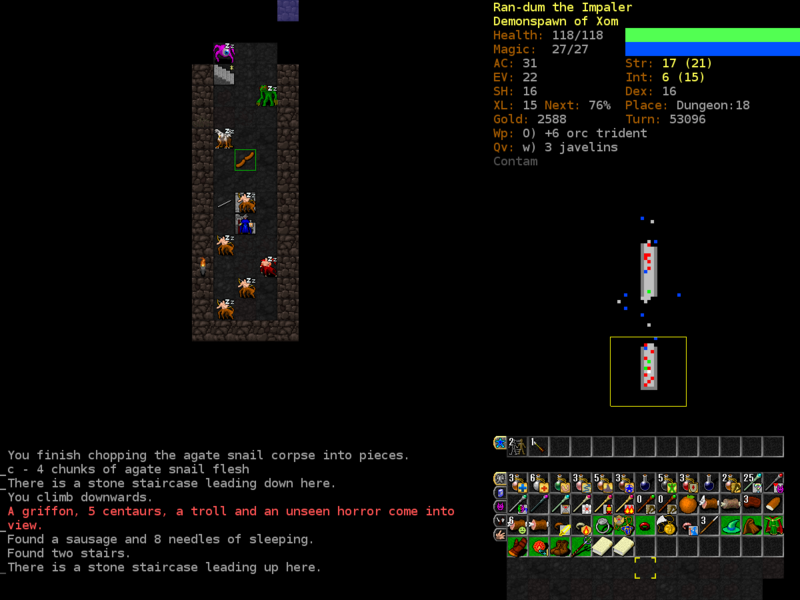 Boggarts are the worst non-unique enemies in the game bar one. Their gimmick is that they have very few hitpoints but they can summon some nasty things, go invisible, blink, etc. On their list of things they can summon is boggarts. Easy enough to dispatch, but once they summon something between you and them, best to just back off. Wands work wonders against them. 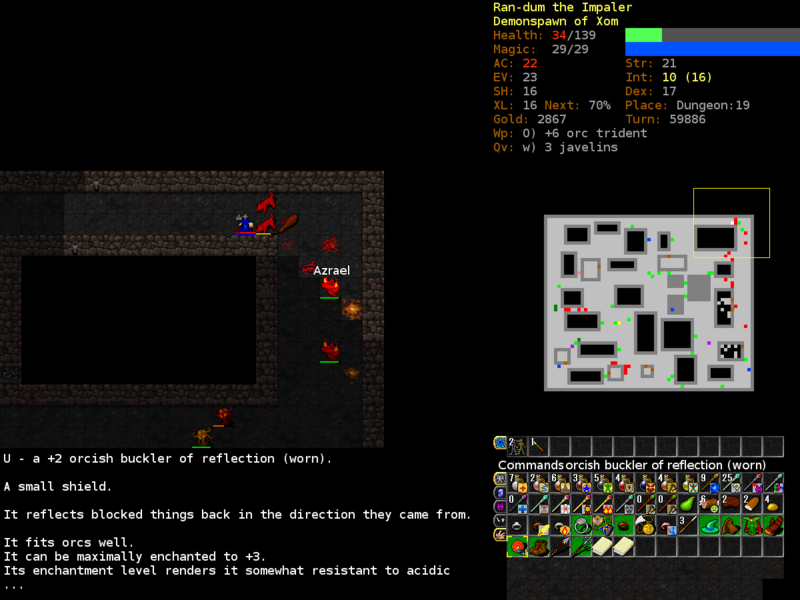 We also find the entrance to the Vaults, another dungeon branch that's eight levels deep. We'll be ready for vaults in about five levels, so we keep it in the back of our minds. 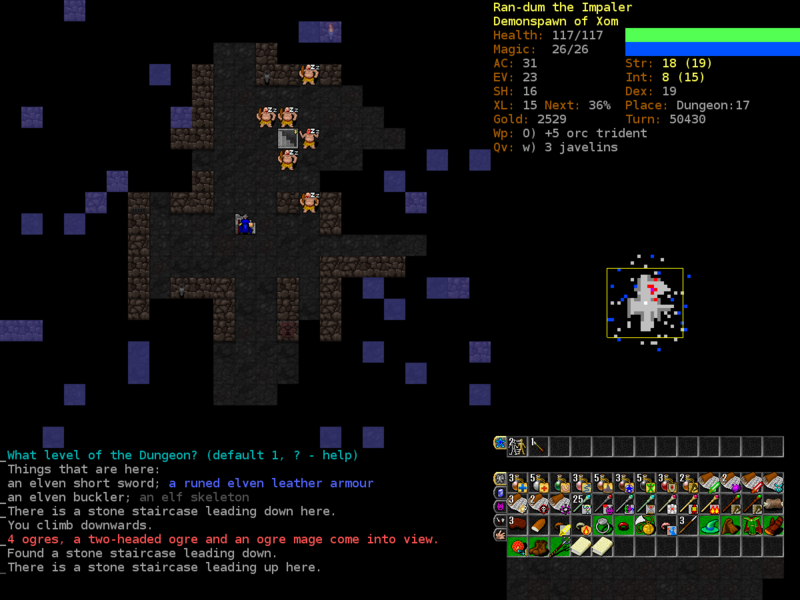 Ogre packs start showing up around d:15 and because of the mages they're always dangerous. 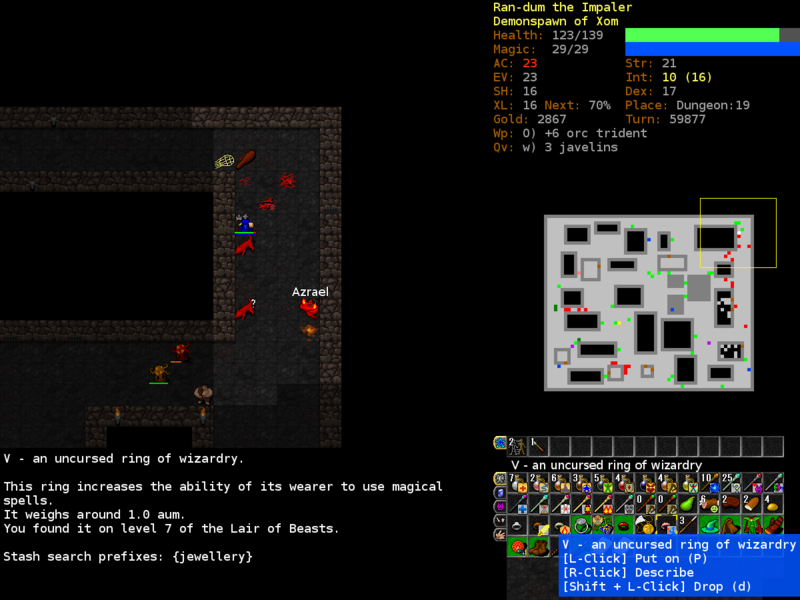 Ogre Magi (the guy with the red head and and hands outstretched) can cast high level spells drawn from a semi-random list of spells, one of which includes banish, a spell that casts you into the abyss. 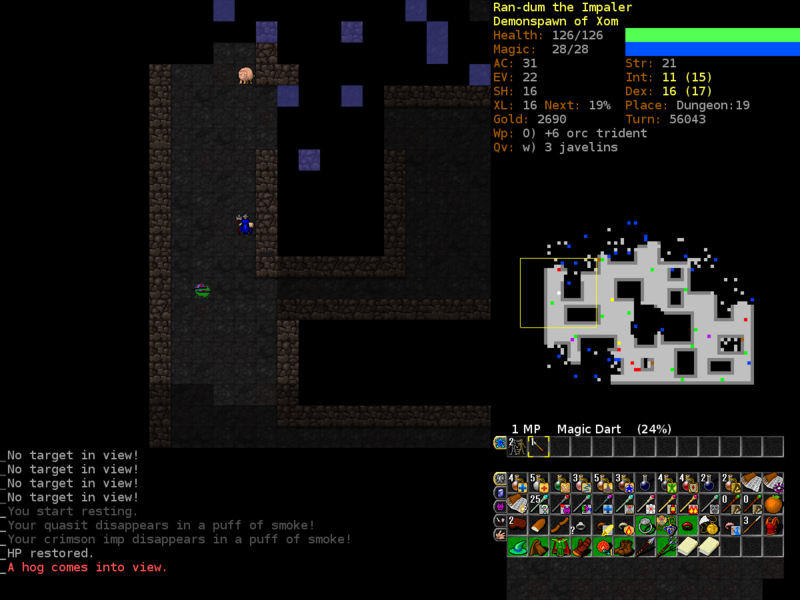 The abyss is a real place in crawl, it has demons and it's very difficult to get out of. We could probably survive a trip there right now, but we'd rather not risk it. 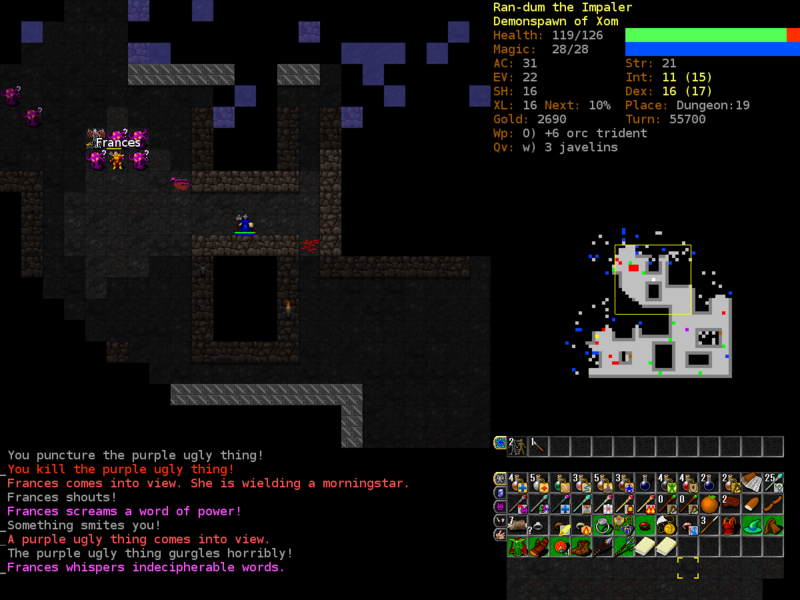 While killing this group, Xom sharpens our vision, removes our talons, Dex-1, removes herbivore 1, removes a level of stable mutation. I'll post our mutations later. Saint Roka is a very dangerous unique. Even if you can kill him in melee, he has smite and can make it hurt. 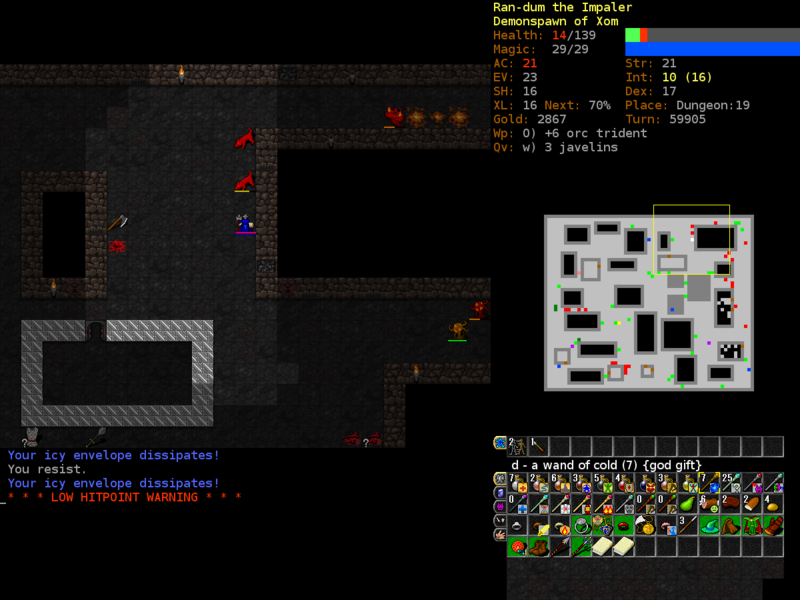 We stair-dance some of his large cadre of orcs, but I decide to not fight him in melee as we'd probably die for trying. 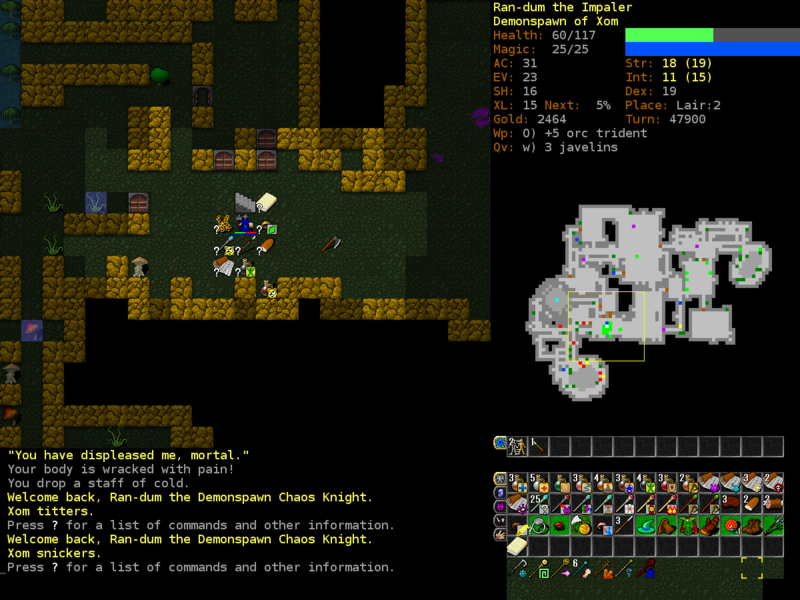 We actually dive down to d:18 to find that it's another cross level. The best way to handle these levels is to stair-dance, even if you think the stuff on-screen looks trivial. 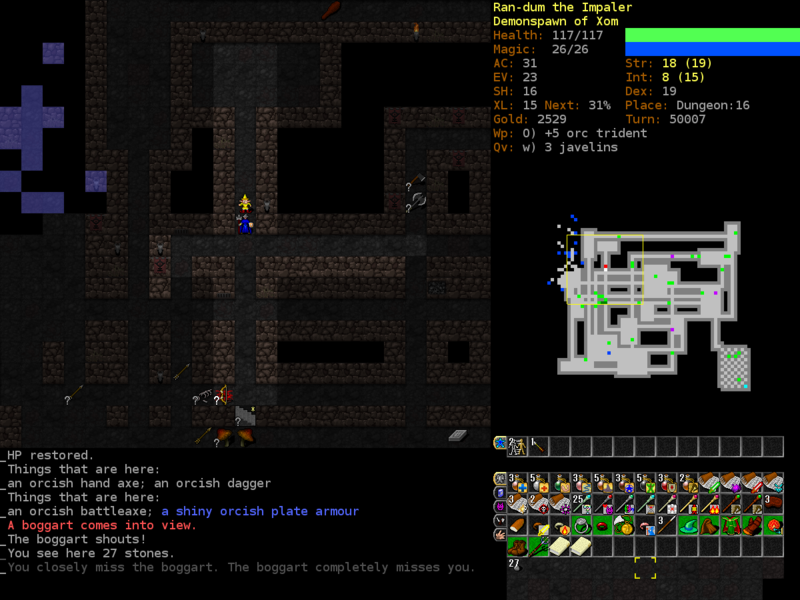 Xom grants us a ring of rC+, dex+4, sustain abilities, named Xoms brutal revenge. While the name is worrysome, we can't really wear that ring natively, so we just keep it in mind. Norris is a pretty cool dude, loves to surf the waves, go invisible, feed on our intellect, hit really hard. 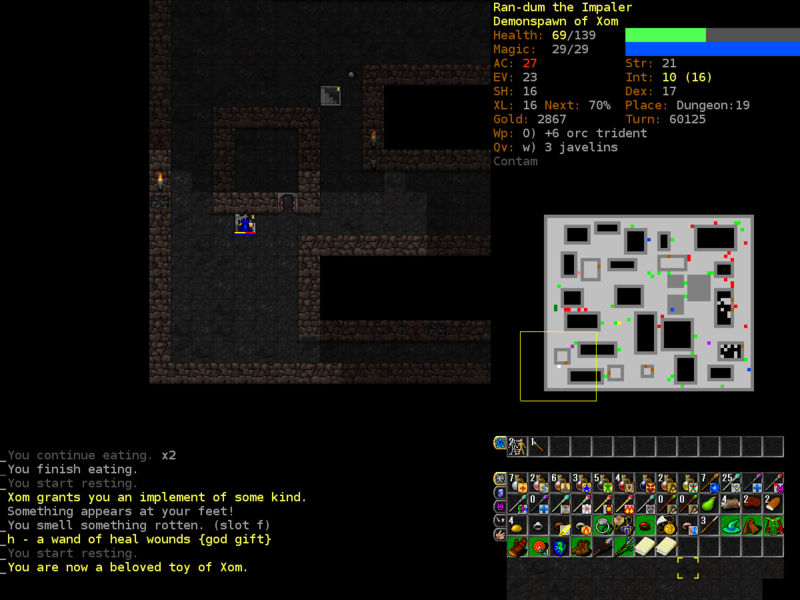 It's a pretty even match until Xom turns him into an elephant slug. I just wanted all that XP elephant slugs are worth 460XP to Norris' 7340, so we lost out on a lot of XP. Frances is dumb, this level is dumb. She's not particularly difficult on her own, but with a group she can be pretty mean. Her description says she once bested a lord of Pandemonium, but that's hard to believe as we take her down like a chump. 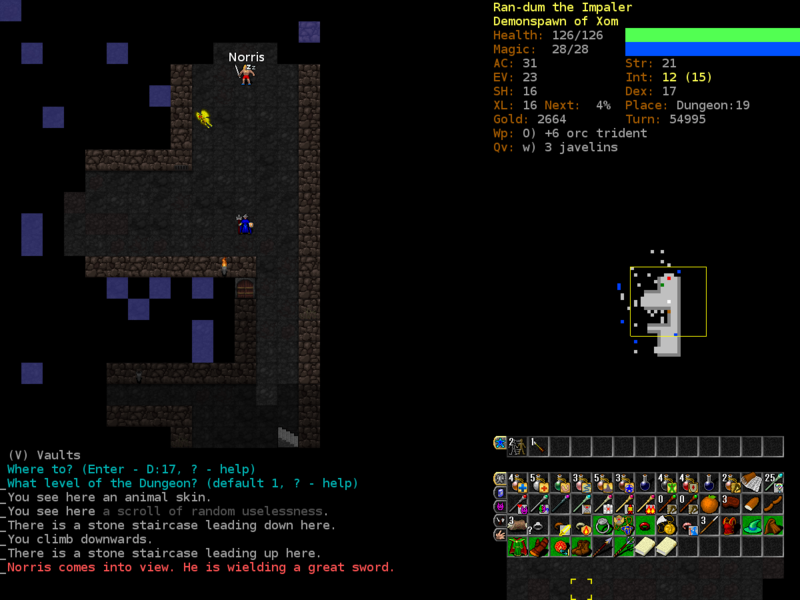 Hogs mean Kirke, a third unique on this level. Like her mythical counterpart, Kirke loves to porkalate folks. Hogs are easy, Kirke is easy, just don't get turned into a hog and try to fight her. Once we see her she says You pig! I'll make you look the way you deserve. Note: we hadn't hit on her or anything. pictured: Us getting porkalated. We wait out the transformation on the other side of the level, pigs move fast, so getting away was easy. Don't forget how easy it was to kill the pigs, fighting her would've been an awful idea. 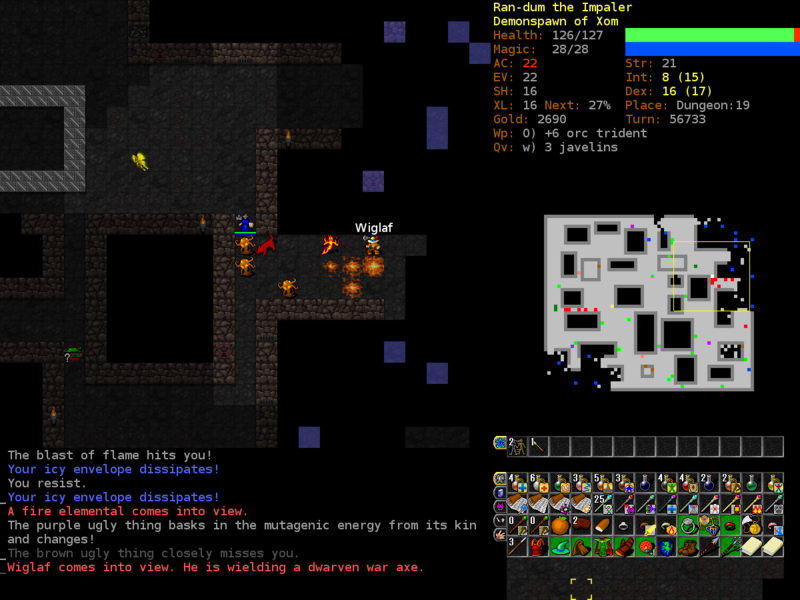 We return and kill Kirke without issue. Wiglaf too, that makes four. Really five, I know there's another unique from this screenshot as well. The fire trail left behind by that elemental helps us a bit, and we take down all the enemies, but Wiglaf forces us to burn some consumables. Alos, we've got a wand of heal wounds, but our hasting wands are empty. Another fire elemental tips me off that we should just leave the level because I don't want to deal with his boss. That's two uniques on two levels that we had to skip, this character is really waning in power and I dunno how long our catches will last. We'll need to do branches soon, but we're not quite ready for it. We're in dire straits, but maybe blink can get us out. At 14 HP, we can't afford a lucky hit from one of the hellhounds and they're throwing fire at us almost every turn. 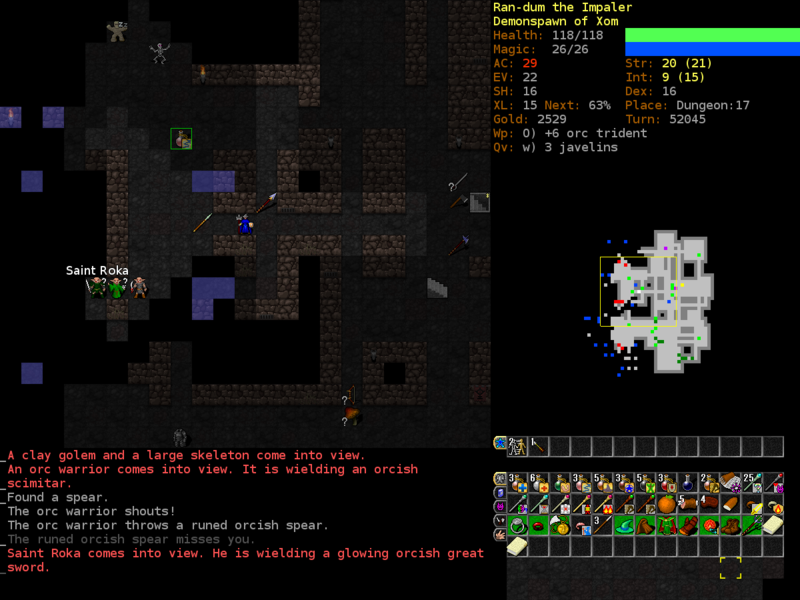 Blink is a level 2 translocation spell that randomly teleports the caster to a tile that's visible. 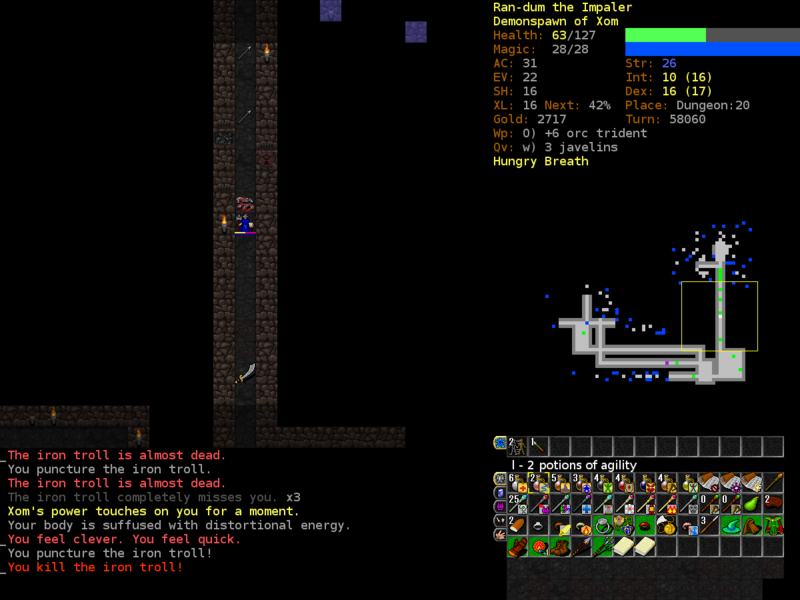 If the tile is lava, wall or otherwise impassable, it chooses another location. Blink could move us ~7 spaces further from the hellhounds, and the worst it will do is put us right between them, not much worse than where we are now. We roll the dice on our ~25% failure rate and after a few casts we make it out. 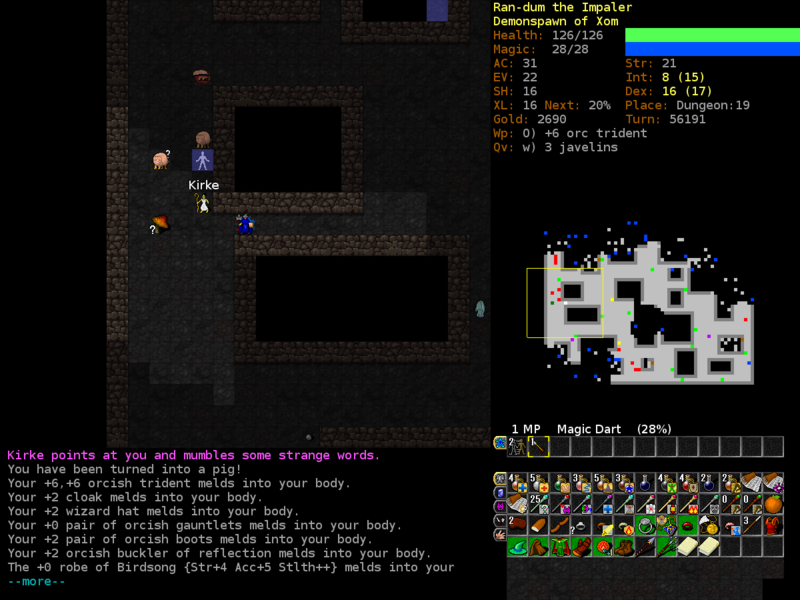 As we stop on the stairs up to rest, Xom grants us another heal wounds wand. 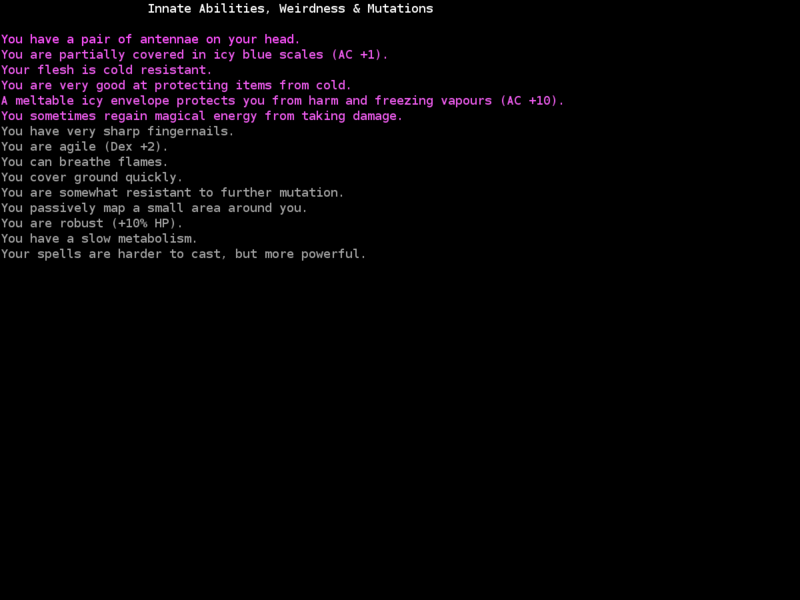 Our current mutation set. It's very taxing to play this character right now because we're so weak. 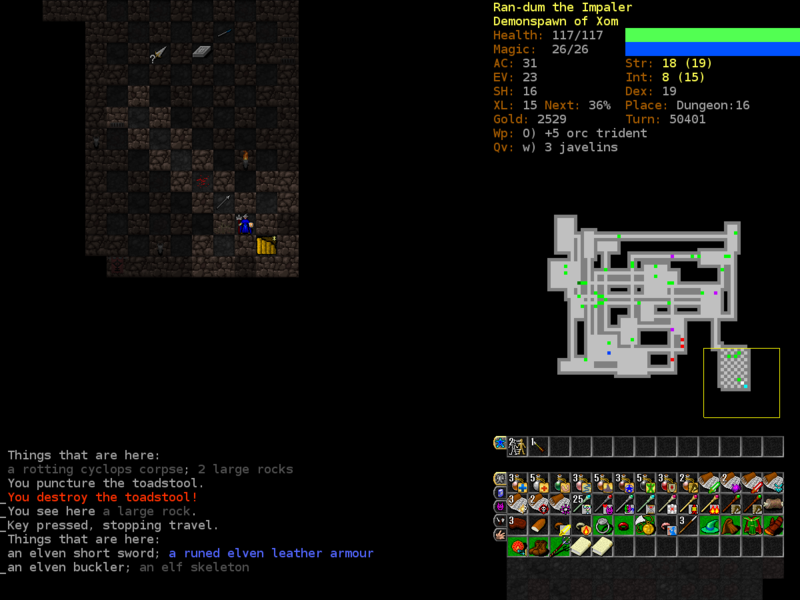 I had planned on shifting to Jiyva after getting to the bottom of the dungeon, but I think I'll have to do it now if we want to get anywhere. 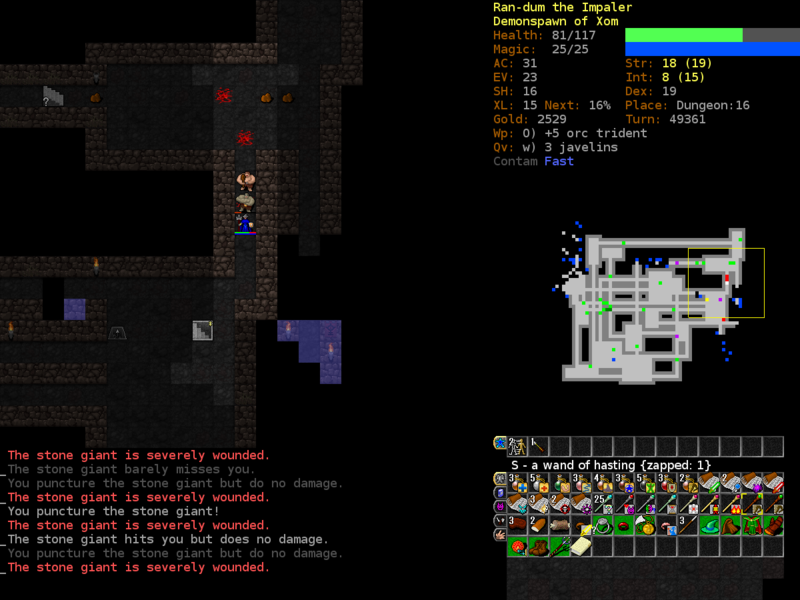 My plan is to do the elven halls down to 4 (of 5) after a bit more of the dungeon, but this character can't currently handle deep troll packs or much more than a single well-armed elf, so it'll be tough going. We should've died twice now. That is a pretty good number for Xommites getting to D:20.